Not so on in many Asian countries, including Japan. A number of dried vegetables have survived to modern times and are eaten on a regular basis. (So are many kinds of dried fish, but that's for another article.) Most of these aren't that readily available outside of Japan, but a few are. Of these, kiriboshi daikon (dried shredded daikon radish) and hoshi shiitake (dried shiitake mushrooms) are probably the most popular, and are usually on the shelves of Japanese grocery stores. Both are very high in fiber and low in calories, and make great additions to various dishes. To use the shiitake, squeeze well and cut off the hard stem. The stems can be put back in the soaking liquid to extract more flavor out of them. The flavor of dried shiitake can vary a lot, so try to find a good brand and stick to it. Good dried shiitake should be very fragrant when you open the bag. 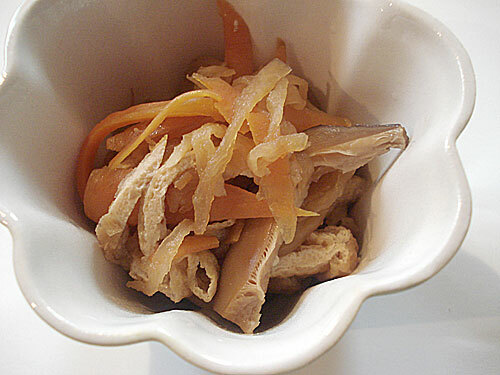 Kiriboshi daikon or dried, shredded daikon radish may be less familiar. White daikon radish is shredded into strips then dried (traditionally in the sun). The drying process brings out the sweetness, and concentrates the fiber and mineral content. 100 grams contains 6.6g of fiber and 94 mg of calcium, plus vitamins B1 and B12 and iron, with only about 20 calories. Since a good handful is enough for most recipes, it's almost no calories at all. It's rather smelly in its dried form, which can be rather off-putting, but the smell goes away once it's soaked and drained. It can be reconstituted either by soaking in cold water for about an hour then rinsed, or by blanching in boiling water for a couple of minutes. Drain away the soaking or blanching water and rinse before using. It's quite neutral in flavor, and takes on the flavors of whatever you cook it in or with like a sponge. It's fairly easy to make your own kiriboshi daikon: just shred up a daikon into long strips, spread out on a basket and dry in the sun for a couple of days (easier in the summer of course), or in a food dehydrator if you have one. There are many other dried vegetables eaten in Japan. The one that you may have had already is kanpyo, or dried gourd strips. This is the brown, sweet stuff you see in some sushi rolls. Kanpyo is often sold pre-cooked in vacuum sealed foil or plastic packets. Besides as sushi rolls they are used for tying up little bags of aburaage (fried bean curd) filled with various things and so on. Do be aware though that the kanpyo used in sushi rolls is sweet because sugar is used in the cooking process. This is the most traditional and popular way to cook kiriboshi daikon. It's usually served in small quantities as a side dish. The only notable calories in this come from the aburaage, which is deep fried, though you get rid of much of the surface oil with the blanching. It's packed with fiber. You can also add some hijiki to this if you like. If you use a vegetarian dashi stock this becomes a vegan dish. Soak the shiitake mushrooms for at least an hour in water. Cut off the stems and slice thinly. Blanch the kiriboshi daikon in rapidly boiling water for about 3 minutes. Drain and cut into pieces if they look too long. Put the aburaage in a bowl and pour some boiling water it. Take out and rinse briefly. This gets rid of a lot of the surface oil it was fried in. Cut into small pieces. Put the dashi stock, water, soy sauce, mirin and sugar in a saucepan and bring to a boil. Add all the other ingredients, and cook over medium high heat, stirring occasionally, until most of the liquid is gone. 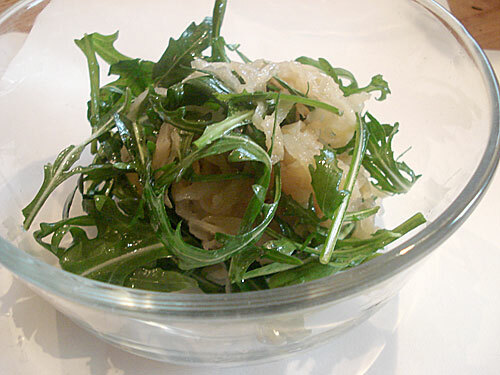 This salad takes advantage of the neutral flavor and chewy-crispy texture of the kiriboshi daikon. You can keep this marinating in the refrigerator until dinner, then toss together with the arugula leaves. Blanch the kiriboshi daikon in rapidly boiling water for about 3 minutes. Drain and rinse under cold water. Drain well. Cut up if the pieces look too long to you. Mix together the oil, lemon juice, salt and pepper and honey. Add the kiriboshi daikon and mix well. Ideally, let marinate in the refrigerator for at least an hour, though you can eat it right away if you're in a hurry. Taste and adjust the salt and pepper if necessary. Toss well with the arugula leaves before serving. Submitted by maki on 2007-01-18 16:17. I like to hear about the dried stuff. In the rural south of the USA we have shucky beans, also called leatherbritches. They are dried green beans, most particularly pole beans, that are cooked up with ham hocks or such. Mighy good, too. There's also an old time fiddle tune called "leather britches". Yep. The dried green beans sound a lot like the ones in Switzerland...they're often cooked with a piece of ham (called a Rippli) too. Great to know that old foods like that still exist in the U.S.! Great recipes! I will use these often. I return to these pages as I am becoming more at ease with handling radishes in this new season of spring. I came to learn the variety of ways they are used in the kitchen to reread and learn more. Yes, how useful your words are now for me! There is a lot of wonderful information here. 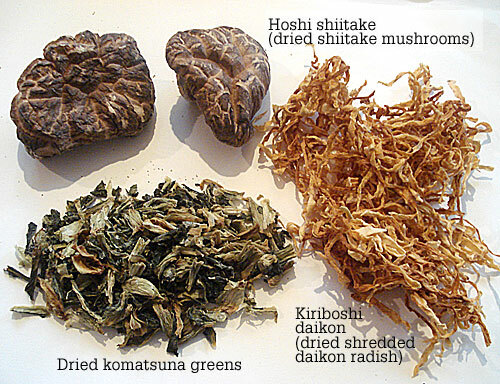 About dried foods in the western cupboard, I am finding dried sea grasses, sea weeds, and many land vegetables (including the wonderful mushroom and daikon) are mentioned increasingly by new food writers and new cooking cuisines in America. I've seen them at OHI, Maine SeaCoast, and for sale at several on-line organic produce providers. At the end of last summer I began to sun dry vegetables which yielded wonderful results. I'm thinking of the red bell pepper powder that I made. Though I didn't use left over produce, I began with very good quality raw organics. The results produced a wonderful deep flavor. These kind of dried vegetables have been tasty additions to simple flat breads and broths. And I add sea grasses to salads often. I am hoping that this tradition will be especially supportive and restorative for all the people of Japan now. That Japan will continue to guard and carry on these ancient traditions for drying foods! I see you mentioned that dried daikon radish loses its flavour... does this mean it can't be used as a substitute in something like nabe? I can't seem to locate where I said dried daikon radish loses flavor, but it has an entirely different texture and flavor profile from fresh daikon, so it's not a good substitute. It needs to be thought of as a different food entirely really.